I’m not going to lie- I have to say quinoa like that just to remember how to spell it! For some reason, my brain dislikes that word even though I really love it. This is such a beautiful breakfast dish! Love these red plums. Sadly they seem about done in my grocery stores. The last couple weeks they weren’t looking too hot. Sniff. This definitely will be better than Quaker Dinosaur Oatmeal,now i just have to come up with a silly name ,so Charlotte will eat it. How about Inca Oatmeal ,because this is a Peruvian Grain.?????? Now I wish I had a bowl of this yummy goodness. Can’t wait to see you in Boston!! Are we aloud to take a picture of us your signing. its early and I can’t spell or form sentences. What I meant to ask is, can we take a picture with you at your signing. Toasted grains are simply the milestone of cooking that need to be discovered earlier. if I knew about this soon I would be a warm breakfast person for many years. Haha so Cute about the pronunciations; I have ones too. I actually said Chriozo like cheerios! This sounds and looks amazing. Keep bringing the breakfast recipes–fall is the only time I actually want to cook breakfast! Yum! Seriously love how quinoa can be used in so many different ways. Including this awesome looking bake! And totally loving the plum + pistachio combo with so many lovely warm spices! So, I used to say (and still do in my head) paleo – the diet, not era – as pa-lay-oh instead of pale-eo. Uhhhhh …. oops? Plus the approach of the diet makes more sense when you say it correctly. I blame it on my bread consumption. I’m the same way with cooking binges, and lately it’s allll dessert in my life. I’m loving your breakfast recipes–if I start my day with a healthy recipe like this, the cookies don’t count right? Have you tried making a big batch of this and reheating it each morning? Any good? I’d like to make it on a Sunday for a week’s worth of breakfasts. yes i totally reheat!! it’s not quite as “texturized” as the first day of eating, but i still think it’s great! I am also prone to fixating. I like an ingredient and I cling to it, using it in everything. Or I bake 5 quick breads in a row. Then I’m over it for a while. Now that has a name: binge-cooking. Good to know! Love that this really is a ‘healthy breakfast’ but looks far more decadent and dessert-like. Delicious. Thanks for sharing! I have never cooked quinoa, and this looks like a great reason to start!!! Looks like a perfect fall breakfast. I have a hard time pronouncing words properly all the time. My mouth often refuses to cooperate with my brain, haha. 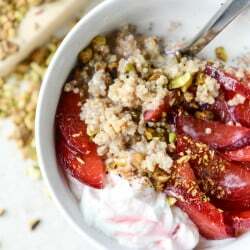 I love this quinoa breakfast idea. And your photography is stunning. I am so making this for breakfast tomorrow and adding apples like you suggested. So excited!!! YUM! I love baked oatmeal, but never thought of doing baked quinoa. Love this! Mmmm I’m definitely going to try this recipe this autumn. I always want to say quinoa “keen-WAHHHHH” like a ninja assassin. It is super bizarre, and I don’t know why it reminds me of a ninja. I imagine wood board being karate chopped…and it makes me happy. It’s here! It’s here! Damn Canadian Amazon finally got me my copy of the book. it’s beautiful! Hahah, I always say “ah-kai” for acai… I’m also guilty of calling Lululemon “Lu-Lu-Mon”, which doesn’t even phonetically make sense, so I’m not sure why my brain sees it that way lol. I loved cooked quinoa, but I never thought about baking it! I’ll have to try this out, because it looks insanely delicious! This looks great! I tried quinoa for breakfast once years ago (actually my first time cooking quinoa ever) and it wasn’t very breakfasty. I think I only had some maple syrup going on probably. But I love this baked recipe, so I think that I’m ready to take another stab at the whole quinoa for breakfast thing! I’ve never done baked quinoa before, even though whenever I see a recipe for it, it looks incred! Do you use coconut milk in the actual quinoa part or just on top? I’d like to use it for everything, but I’m wondering if it would be too thick for the quinoa to absorb. Do you think lite coconut milk would work? i use it for both – but i often do use a lighter version if i cook it in the milk. i like the trader joe’s lite coconut milk. i also use almond milk and will sometimes mix full fat coconut milk with some water. usually the topping is full fat coconut because i love it so much! Seriously, bring on the breakfast food binge — I FREAKING LOVE breakfast – yes, hands down my favourite meal of the day … This breakfast bowl, umm – yea, sign me up! i do that too! and i pronounce jalapeno with a J, so i sound REAL dumb when i order stuff at mexican. I am incredibly excited to try this baked quinoa (my auto-correct wants to change that to “Joaquin” …). Waiting (not so patiently) for the mail lady to leave a certain cookbook on my doorstep!! This looks totally amazing and loved that you used quinoa instead of oats!! I’m so excited that you’ve made a few recipes with plums (plus the one in your book which is so simple and wonderful) because I have ten billion of them in a bowl in my fridge. Thank ya, lady! BRING ON ALL THE BREAKFAST FOOD. Because I ridiculously need more breakfasts like this quinoa situation in my life. This is my favorite recipe ever, i eat it all the time.. minus the nuts, not crazy about nuts. Have you tried to stew peaches like that? I go between peaches and plums.. but plums add that nice sour taste.. mmm.. so good! i have not… and now i must!! I just inherited a big bag of plums so I am DEFINITELY going to be all over this. This looks like a great use for leftover quinoa. And, if it’s any consolation, certain people in my household still pronounce it wrong. It makes me laugh every time! What an awesome and creative way to eat quinoa! I’m definitely trying this! I’m like that with cooking too! I’m also on a breakfast hype at the moment, and all I want are breakfast bowls. Pitaya bowls, acai bowl, avocado bowls… I’ll have to try this baked quinoa bowl! It looks so amazingly delish! Congratulations on your book! Can’t wait to see you in San Francisco! Binge blogging.. yes! I do it all.the.time and I drive myself mad because I suddenly realise I have sixteen ice cream recipes at once… aargh! I love stewing plums, especially when they’re just a little sour – they’re so juicy and sweet! i have yet to try quinoa in the morning but lately, steel cut oatmeal is my goto breakfast. Quinoa is up next! I’d have this deliciousness for breakfast EVERY day, and I love the binge blogging of awesome recipes, keep ’em coming! I’ve never had quinoa for breakfast! I could get down with that though. are underused fruits. I guess because now you see them, now you don’t. So it’s good to see that you are taking advantage of them while they are here. This sounds awesome and a great way to sneak in some tasty fiber for my 8yo twin boys. Will this do well if made ahead of time? And if so, would it be best to freeze the baked portion or just leave in the frig? I am eating this as I type! SO thankful my baby napped long enough for me to get this in the oven! So deiish and wonderfully packed with protein! I also roasted some peaches after being inspired by your waffle recipe so I can top a bowl or two with those later this week! ugh, I have a serious problem with only using exclamation marks…seriously.